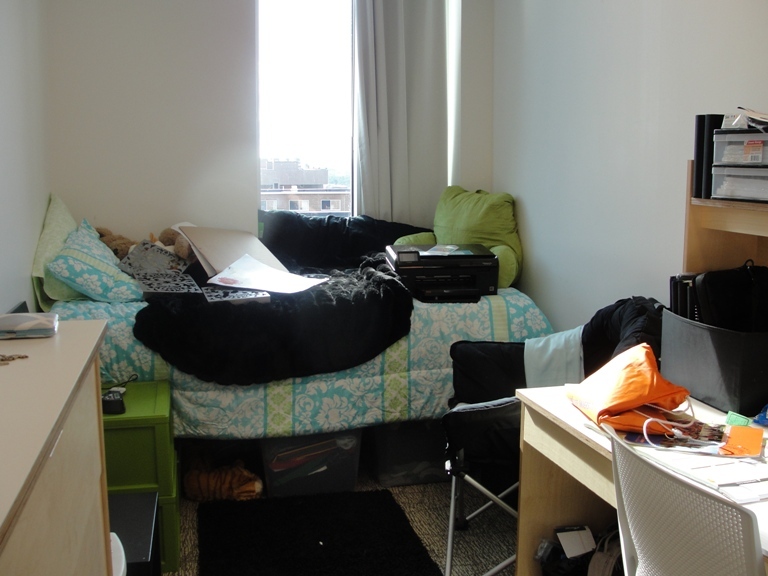 This is the most recent configuration of the new dorm room. We took 2 SUV’s full of Becca’s belongings to college. I thought for sure that we would be bringing back at least half. Turns out the kids knows how to pack and organize. We pulled up to the check in area and unloaded everything into two giant piles on the sidewalk. Upper classman volunteers wearing orange shirts printed with “goon squad” arrived with rolling bins and whisked everything up to her dorm room. Some kids only need one or possibly two bins. We needed seven. Oddly enough, we fit every thing into the dorm. We made the bed and put things on the dresser top and then we rearranged the furniture and moved the bed from the left side to the right side. Then we saw a room down the hall arranged differently and came back to her room and did the same thing. Then some friends she met on face book came by and suggested the way they did it with the bed against the window wall. She went and checked out their room and we then re-arranged her room, again. I am sure there will be further reconfigurations during the next few months. She was thrilled that it all fit and that she still has room to move around. By 6 pm we were just happy to be able to finally take a rest. I hope she is happy!